It is with a broken heart that I have to tell you that Ole Blue was destroyed on May 24th whilst driving to the 50th National Rally. 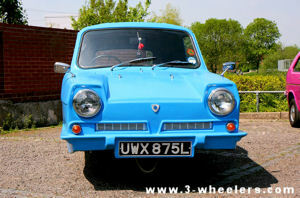 Caroline and I were in Ole Blue (My Reliant Regal Supervan III) and a few times we smelt petrol but as we were following Old Red (a 1949 Reliant 8cwt van driven by my brother Geoff) we thought it was that as when we pulled back the fumes vanished. After about 50 miles, whilst on the M54 Old Red had a few problems and pulled over so we pulled up behind Geoff. I went over to see Geoff and noticed something dripping under Ole Blue. I opened the bonnet and the fuel line had a crack in it but as I'd positioned it away from things the fuel was just spurting onto the bulk head and dripping on the road. We fixed the pipe and tested it, all seemed fine though just before we closed the bonnet their was a strange "pop" sound from the carburetor. 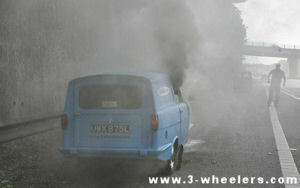 We joked that Ole Blue had a cough and closed the bonnet. Caroline (My girlfriend) and I got back in the car and suddenly thick grey smoke came pouring into the inside of the car. I screamed at Caroline to get out and move away and I jumped out. I grabbed my fire extinguisher and opened the bonnet and the extinguisher was useless, about a 3 second burst and that was it but as the smoke was now that thick I couldn't see a thing inside the engine bay so wasn't actually sure it the spray even landed on fire. 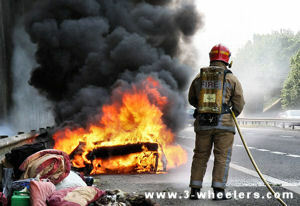 Geoff came charging over with a blanket saying push her back as the road was now also on fire. He started beating the flames that now appeared through the smoke and bless him was shouting "we can't let her go". We pushed the car back again and with Herculean strength Geoff picked up the car about 4 ft off the ground, in an attempt, I later discovered, to cut off the fuel pipe from feeding the fire. The horn on Ole Blue then went off and wouldn't stop and with the heat it almost sounded as though Ole Blue was screaming in pain, I just had to open the door and reach inside to pull the electrical cut off switch, the horn stopped. By now the smoke was too thick and I told Geoff it's too late and said we need to unload everything as our equipment was in there. We emptied the contents out of the back and choking on smoke got my wallet and phone out of the front but for my Tom Tom it was too late as flames were starting to come through the bulk head. We backed off and feeling completely helpless I grabbed my camera. For a few moments there was just smoke bellowing out of the front and then the horn went off again, even though the cut off switch had been activated. 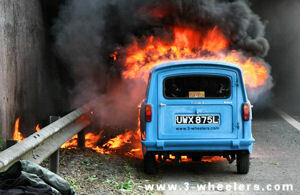 Suddenly there was a flash of flames at the front and Ole Blue gave one last scream before falling silent. 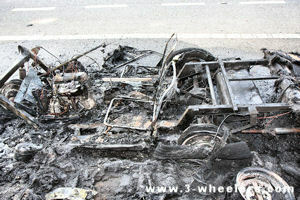 The flames were possessed and with a wild fury they took hold and ran down the length of the car. There was four bangs as each tyre (counting the spare) exploded and as the flames reached the back door, Ole Blue vanished in a cloud of smoke. 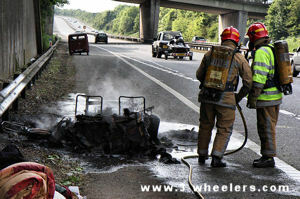 The Fire Brigade came really quickly but Ole Blue burnt up within a few minutes. Once they hosed her down all that was left was the chassis with a few lumps of metal. The carburetor had completely vanished, all that was there was a lump of molten aluminium. Geoff thinks that perhaps the float somehow became stuck and overflowed fuel onto the manifold. Pete, looking just as shocked as we were, also came rushing out from the Reliant rally (Thanks Pete and sorry if I didn't thank you properly at the time) though as I had AA cover they said they would take all our camping gear home as well. After a long wait, Ole Blue's remains were carted off to a storage depot in Shrewsbury. We followed in a lorry behind and small burnt bits of Ole Blue were flying off everywhere. 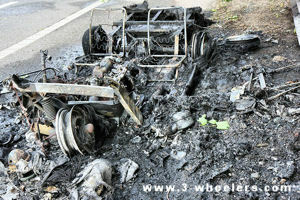 The chassis and petrol tank still seem fairly good but everything else was just destroyed. To say I am absolutely gutted is an understatement. I'd been watching the speedometer as we were going along and when we stopped it was on 901. That's just 901 miles covered since she was rebuilt. The irony is that I've had a thing about a fire this week, I even went out and bought a fire proof safe for the house and before the journey checked the fuel lines (they were fine then). I even doubled checked that I didn't obscure the fire extinguisher with the camping gear and usually I never give it a second thought. Ole Blue two weeks earlier on May 11th, a photo I took for my insurance as it expired on May 29th and they requested new photos. It was at this point that we helplessly realised there was nothing more that we could do to save Ole Blue. The flames appeared and within seconds spread into an inferno working its way along Ole Blue. Ole Blue's last ever picture as the car I recognise. 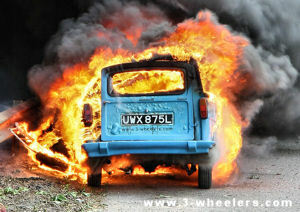 By now the fire brigade had appeared but despite their amazingly quick response time it was too late for Ole Blue. When the smoke clear all that remained was a mangled mess. 15 months of hard work .. all gone.